Definition at line 31 of file xmmintrin.h. Referenced by _mm_add_ps(), _mm_add_ss(), _mm_and_ps(), _mm_andnot_ps(), _mm_cmpeq_ps(), _mm_cmpeq_ss(), _mm_cmpge_ps(), _mm_cmpge_ss(), _mm_cmpgt_ps(), _mm_cmpgt_ss(), _mm_cmple_ps(), _mm_cmple_ss(), _mm_cmplt_ps(), _mm_cmplt_ss(), _mm_cmpneq_ps(), _mm_cmpneq_ss(), _mm_cmpnge_ps(), _mm_cmpnge_ss(), _mm_cmpngt_ps(), _mm_cmpngt_ss(), _mm_cmpnle_ps(), _mm_cmpnle_ss(), _mm_cmpnlt_ps(), _mm_cmpnlt_ss(), _mm_cmpord_ps(), _mm_cmpord_ss(), _mm_cmpunord_ps(), _mm_cmpunord_ss(), _mm_comieq_ss(), _mm_comige_ss(), _mm_comigt_ss(), _mm_comile_ss(), _mm_comilt_ss(), _mm_comineq_ss(), _mm_cvt_pi2ps(), _mm_cvt_ps2pi(), _mm_cvt_si2ss(), _mm_cvt_ss2si(), _mm_cvtps_pi8(), _mm_cvtsi32_ss(), _mm_cvtss_f32(), _mm_cvtss_si32(), _mm_cvtt_ps2pi(), _mm_cvtt_ss2si(), _mm_cvttss_si32(), _mm_div_ps(), _mm_div_ss(), _mm_load_ps(), _mm_load_ss(), _mm_loadh_pi(), _mm_loadl_pi(), _mm_loadr_ps(), _mm_loadu_ps(), _mm_max_ps(), _mm_max_ss(), _mm_min_ps(), _mm_min_ss(), _mm_move_ss(), _mm_movehl_ps(), _mm_mul_ps(), _mm_mul_ss(), _mm_or_ps(), _mm_rcp_ps(), _mm_rcp_ss(), _mm_rsqrt_ps(), _mm_rsqrt_ss(), _mm_set1_ps(), _mm_set_ps(), _mm_set_ps1(), _mm_set_ss(), _mm_setr_ps(), _mm_setzero_ps(), _mm_sqrt_ps(), _mm_sqrt_ss(), _mm_store1_ps(), _mm_store_ps(), _mm_store_ps1(), _mm_store_ss(), _mm_storeh_pi(), _mm_storel_pi(), _mm_storeu_ps(), _mm_stream_pi(), _mm_sub_ps(), _mm_sub_ss(), _mm_ucomieq_ss(), _mm_ucomige_ss(), _mm_ucomigt_ss(), _mm_ucomile_ss(), _mm_ucomilt_ss(), _mm_ucomineq_ss(), _mm_undefined_ps(), _mm_unpackhi_ps(), _mm_unpacklo_ps(), and _mm_xor_ps(). Definition at line 32 of file xmmintrin.h. Referenced by _mm_avg_pu16(), _mm_avg_pu8(), _mm_cvt_si2ss(), _mm_cvt_ss2si(), _mm_cvtpi16_ps(), _mm_cvtpi32_ps(), _mm_cvtpi32x2_ps(), _mm_cvtpi8_ps(), _mm_cvtps_pi16(), _mm_cvtps_pi32(), _mm_cvtpu16_ps(), _mm_cvtpu8_ps(), _mm_cvtt_ss2si(), _mm_cvttps_pi32(), _mm_maskmove_si64(), _mm_max_pi16(), _mm_max_pu8(), _mm_min_pi16(), _mm_min_pu8(), _mm_movelh_ps(), and _mm_movemask_pi8(). Definition at line 2990 of file xmmintrin.h. Definition at line 2985 of file xmmintrin.h. Definition at line 2986 of file xmmintrin.h. Definition at line 2987 of file xmmintrin.h. Definition at line 2976 of file xmmintrin.h. Definition at line 2977 of file xmmintrin.h. Definition at line 2978 of file xmmintrin.h. Definition at line 2979 of file xmmintrin.h. Definition at line 2980 of file xmmintrin.h. Definition at line 2981 of file xmmintrin.h. Definition at line 2982 of file xmmintrin.h. Definition at line 2983 of file xmmintrin.h. Definition at line 2988 of file xmmintrin.h. Definition at line 2984 of file xmmintrin.h. Definition at line 2922 of file xmmintrin.h. Definition at line 2927 of file xmmintrin.h. Definition at line 2928 of file xmmintrin.h. Definition at line 2931 of file xmmintrin.h. Definition at line 2926 of file xmmintrin.h. Definition at line 2932 of file xmmintrin.h. Definition at line 2929 of file xmmintrin.h. Definition at line 2930 of file xmmintrin.h. Extracts 16-bit element from a 64-bit vector of [4 x i16] and returns it, as specified by the immediate integer operand. This intrinsic corresponds to the VPEXTRW / PEXTRW instruction. a A 64-bit vector of [4 x i16]. 0: Bits [15:0] are copied to the destination. 1: Bits [31:16] are copied to the destination. 2: Bits [47:32] are copied to the destination. 3: Bits [63:48] are copied to the destination. A 16-bit integer containing the extracted 16 bits of packed data. Definition at line 2175 of file xmmintrin.h. Definition at line 2948 of file xmmintrin.h. Definition at line 2950 of file xmmintrin.h. Definition at line 2949 of file xmmintrin.h. Definition at line 2952 of file xmmintrin.h. Definition at line 2953 of file xmmintrin.h. Definition at line 2954 of file xmmintrin.h. Definition at line 2955 of file xmmintrin.h. Definition at line 2060 of file xmmintrin.h. Definition at line 2061 of file xmmintrin.h. Definition at line 2065 of file xmmintrin.h. Definition at line 2062 of file xmmintrin.h. Definition at line 2063 of file xmmintrin.h. Definition at line 2064 of file xmmintrin.h. Copies data from the 64-bit vector of [4 x i16] to the destination, and inserts the lower 16-bits of an integer operand at the 16-bit offset specified by the immediate operand n.
This intrinsic corresponds to the PINSRW instruction. d An integer. The lower 16-bit value from this operand is written to the destination at the offset specified by operand n.
n An immediate integer operant that determines which the bits to be used in the destination. The remaining bits in the destination are copied from the corresponding bits in operand a. A 64-bit integer vector containing the copied packed data from the operands. Definition at line 2206 of file xmmintrin.h. Definition at line 1709 of file xmmintrin.h. Definition at line 2935 of file xmmintrin.h. Definition at line 2936 of file xmmintrin.h. Definition at line 2939 of file xmmintrin.h. Definition at line 2934 of file xmmintrin.h. Definition at line 2940 of file xmmintrin.h. Definition at line 2937 of file xmmintrin.h. Definition at line 2938 of file xmmintrin.h. Loads one cache line of data from the specified address to a location closer to the processor. This intrinsic corresponds to the PREFETCHNTA instruction. a A pointer to a memory location containing a cache line of data. _MM_HINT_NTA: Move data using the non-temporal access (NTA) hint. The PREFETCHNTA instruction will be generated. _MM_HINT_T0: Move data using the T0 hint. The PREFETCHT0 instruction will be generated. _MM_HINT_T1: Move data using the T1 hint. The PREFETCHT1 instruction will be generated. _MM_HINT_T2: Move data using the T2 hint. The PREFETCHT2 instruction will be generated. Definition at line 2095 of file xmmintrin.h. Definition at line 2943 of file xmmintrin.h. Definition at line 2946 of file xmmintrin.h. Definition at line 2942 of file xmmintrin.h. Definition at line 2945 of file xmmintrin.h. Definition at line 2944 of file xmmintrin.h. Definition at line 2957 of file xmmintrin.h. Definition at line 2958 of file xmmintrin.h. Definition at line 2959 of file xmmintrin.h. Definition at line 2960 of file xmmintrin.h. Definition at line 2924 of file xmmintrin.h. Shuffles the 4 16-bit integers from a 64-bit integer vector to the destination, as specified by the immediate value operand. This intrinsic corresponds to the PSHUFW instruction. a A 64-bit integer vector containing the values to be shuffled. Bits [1:0] are used to assign values to bits [15:0] in the destination. Bits [3:2] are used to assign values to bits [31:16] in the destination. Bits [5:4] are used to assign values to bits [47:32] in the destination. Bits [7:6] are used to assign values to bits [63:48] in the destination. 00: assigned from bits [15:0] of a. 01: assigned from bits [31:16] of a. 10: assigned from bits [47:32] of a. 11: assigned from bits [63:48] of a. A 64-bit integer vector containing the shuffled values. Definition at line 2353 of file xmmintrin.h. Selects 4 float values from the 128-bit operands of [4 x float], as specified by the immediate value operand. This intrinsic corresponds to the VSHUFPS / SHUFPS instruction. a A 128-bit vector of [4 x float]. b A 128-bit vector of [4 x float]. mask An immediate value containing an 8-bit value specifying which elements to copy from a and b. Bits [3:0] specify the values copied from operand a. Bits [7:4] specify the values copied from operand b. Bits [1:0] are used to assign values to bits [31:0] in the destination. Bits [3:2] are used to assign values to bits [63:32] in the destination. Bits [5:4] are used to assign values to bits [95:64] in the destination. Bits [7:6] are used to assign values to bits [127:96] in the destination. 00: Bits [31:0] copied from the specified operand. 01: Bits [63:32] copied from the specified operand. 10: Bits [95:64] copied from the specified operand. 11: Bits [127:96] copied from the specified operand. A 128-bit vector of [4 x float] containing the shuffled values. Definition at line 2595 of file xmmintrin.h. Constructs a 128-bit floating-point vector of [4 x float]. Definition at line 2962 of file xmmintrin.h. Definition at line 15 of file xmmintrin.h. Adds two 128-bit vectors of [4 x float], and returns the results of the addition. This intrinsic corresponds to the VADDPS / ADDPS instructions. __a A 128-bit vector of [4 x float] containing one of the source operands. __b A 128-bit vector of [4 x float] containing one of the source operands. A 128-bit vector of [4 x float] containing the sums of both operands. Definition at line 70 of file xmmintrin.h. Referenced by _mm_mask_add_ps(), and _mm_maskz_add_ps(). Adds the 32-bit float values in the low-order bits of the operands. This intrinsic corresponds to the VADDSS / ADDSS instructions. __a A 128-bit vector of [4 x float] containing one of the source operands. The lower 32 bits of this operand are used in the calculation. __b A 128-bit vector of [4 x float] containing one of the source operands. The lower 32 bits of this operand are used in the calculation. A 128-bit vector of [4 x float] whose lower 32 bits contain the sum of the lower 32 bits of both operands. The upper 96 bits are copied from the upper 96 bits of the first source operand. Definition at line 50 of file xmmintrin.h. Referenced by _mm_mask_add_ss(), and _mm_maskz_add_ss(). Performs a bitwise AND of two 128-bit vectors of [4 x float]. This intrinsic corresponds to the VANDPS / ANDPS instructions. __a A 128-bit vector containing one of the source operands. __b A 128-bit vector containing one of the source operands. A 128-bit vector of [4 x float] containing the bitwise AND of the values between both operands. Definition at line 404 of file xmmintrin.h. Referenced by _mm_mask_and_ps(), and _mm_maskz_and_ps(). Performs a bitwise AND of two 128-bit vectors of [4 x float], using the one's complement of the values contained in the first source operand. This intrinsic corresponds to the VANDNPS / ANDNPS instructions. __a A 128-bit vector of [4 x float] containing the first source operand. The one's complement of this value is used in the bitwise AND. __b A 128-bit vector of [4 x float] containing the second source operand. A 128-bit vector of [4 x float] containing the bitwise AND of the one's complement of the first operand and the values in the second operand. Definition at line 426 of file xmmintrin.h. Referenced by _mm_mask_andnot_ps(), and _mm_maskz_andnot_ps(). Computes the rounded averages of the packed unsigned 16-bit integer values and writes the averages to the corresponding bits in the destination. This intrinsic corresponds to the PAVGW instruction. __a A 64-bit integer vector containing one of the source operands. __b A 64-bit integer vector containing one of the source operands. A 64-bit integer vector containing the averages of both operands. Definition at line 2418 of file xmmintrin.h. Computes the rounded averages of the packed unsigned 8-bit integer values and writes the averages to the corresponding bits in the destination. This intrinsic corresponds to the PAVGB instruction. Definition at line 2399 of file xmmintrin.h. Compares each of the corresponding 32-bit float values of the 128-bit vectors of [4 x float] for equality. This intrinsic corresponds to the VCMPEQPS / CMPEQPS instructions. __a A 128-bit vector of [4 x float]. __b A 128-bit vector of [4 x float]. A 128-bit vector of [4 x float] containing the comparison results. Definition at line 503 of file xmmintrin.h. Compares two 32-bit float values in the low-order bits of both operands for equality and returns the result of the comparison in the low-order bits of a vector [4 x float]. This intrinsic corresponds to the VCMPEQSS / CMPEQSS instructions. __a A 128-bit vector of [4 x float] containing one of the operands. The lower 32 bits of this operand are used in the comparison. __b A 128-bit vector of [4 x float] containing one of the operands. The lower 32 bits of this operand are used in the comparison. A 128-bit vector of [4 x float] containing the comparison results in the low-order bits. Definition at line 485 of file xmmintrin.h. Compares each of the corresponding 32-bit float values of the 128-bit vectors of [4 x float] to determine if the values in the first operand are greater than or equal to those in the second operand. This intrinsic corresponds to the VCMPLEPS / CMPLEPS instructions. Definition at line 677 of file xmmintrin.h. Compares two 32-bit float values in the low-order bits of both operands to determine if the value in the first operand is greater than or equal to the corresponding value in the second operand and returns the result of the comparison in the low-order bits of a vector of [4 x float]. This intrinsic corresponds to the VCMPLESS / CMPLESS instructions. Definition at line 656 of file xmmintrin.h. Compares each of the corresponding 32-bit float values of the 128-bit vectors of [4 x float] to determine if the values in the first operand are greater than those in the second operand. This intrinsic corresponds to the VCMPLTPS / CMPLTPS instructions. Definition at line 632 of file xmmintrin.h. Compares two 32-bit float values in the low-order bits of both operands to determine if the value in the first operand is greater than the corresponding value in the second operand and returns the result of the comparison in the low-order bits of a vector of [4 x float]. This intrinsic corresponds to the VCMPLTSS / CMPLTSS instructions. Definition at line 611 of file xmmintrin.h. Compares each of the corresponding 32-bit float values of the 128-bit vectors of [4 x float] to determine if the values in the first operand are less than or equal to those in the second operand. Definition at line 588 of file xmmintrin.h. Compares two 32-bit float values in the low-order bits of both operands to determine if the value in the first operand is less than or equal to the corresponding value in the second operand and returns the result of the comparison in the low-order bits of a vector of [4 x float]. Definition at line 569 of file xmmintrin.h. Compares each of the corresponding 32-bit float values of the 128-bit vectors of [4 x float] to determine if the values in the first operand are less than those in the second operand. Definition at line 545 of file xmmintrin.h. Compares two 32-bit float values in the low-order bits of both operands to determine if the value in the first operand is less than the corresponding value in the second operand and returns the result of the comparison in the low-order bits of a vector of [4 x float]. Definition at line 526 of file xmmintrin.h. Compares each of the corresponding 32-bit float values of the 128-bit vectors of [4 x float] for inequality. This intrinsic corresponds to the VCMPNEQPS / CMPNEQPS instructions. Definition at line 719 of file xmmintrin.h. Compares two 32-bit float values in the low-order bits of both operands for inequality and returns the result of the comparison in the low-order bits of a vector of [4 x float]. This intrinsic corresponds to the VCMPNEQSS / CMPNEQSS instructions. Definition at line 700 of file xmmintrin.h. Compares each of the corresponding 32-bit float values of the 128-bit vectors of [4 x float] to determine if the values in the first operand are not greater than or equal to those in the second operand. This intrinsic corresponds to the VCMPNLEPS / CMPNLEPS instructions. Definition at line 902 of file xmmintrin.h. Compares two 32-bit float values in the low-order bits of both operands to determine if the value in the first operand is not greater than or equal to the corresponding value in the second operand and returns the result of the comparison in the low-order bits of a vector of [4 x float]. This intrinsic corresponds to the VCMPNLESS / CMPNLESS instructions. Definition at line 880 of file xmmintrin.h. Compares each of the corresponding 32-bit float values of the 128-bit vectors of [4 x float] to determine if the values in the first operand are not greater than those in the second operand. This intrinsic corresponds to the VCMPNLTPS / CMPNLTPS instructions. Definition at line 855 of file xmmintrin.h. Compares two 32-bit float values in the low-order bits of both operands to determine if the value in the first operand is not greater than the corresponding value in the second operand and returns the result of the comparison in the low-order bits of a vector of [4 x float]. This intrinsic corresponds to the VCMPNLTSS / CMPNLTSS instructions. Definition at line 833 of file xmmintrin.h. Compares each of the corresponding 32-bit float values of the 128-bit vectors of [4 x float] to determine if the values in the first operand are not less than or equal to those in the second operand. Definition at line 808 of file xmmintrin.h. Compares two 32-bit float values in the low-order bits of both operands to determine if the value in the first operand is not less than or equal to the corresponding value in the second operand and returns the result of the comparison in the low-order bits of a vector of [4 x float]. Definition at line 788 of file xmmintrin.h. Compares each of the corresponding 32-bit float values of the 128-bit vectors of [4 x float] to determine if the values in the first operand are not less than those in the second operand. Definition at line 763 of file xmmintrin.h. Compares two 32-bit float values in the low-order bits of both operands to determine if the value in the first operand is not less than the corresponding value in the second operand and returns the result of the comparison in the low-order bits of a vector of [4 x float]. Definition at line 743 of file xmmintrin.h. Compares each of the corresponding 32-bit float values of the 128-bit vectors of [4 x float] to determine if the values in the first operand are ordered with respect to those in the second operand. This intrinsic corresponds to the VCMPORDPS / CMPORDPS instructions. Definition at line 947 of file xmmintrin.h. Compares two 32-bit float values in the low-order bits of both operands to determine if the value in the first operand is ordered with respect to the corresponding value in the second operand and returns the result of the comparison in the low-order bits of a vector of [4 x float]. This intrinsic corresponds to the VCMPORDSS / CMPORDSS instructions. Definition at line 927 of file xmmintrin.h. Compares each of the corresponding 32-bit float values of the 128-bit vectors of [4 x float] to determine if the values in the first operand are unordered with respect to those in the second operand. This intrinsic corresponds to the VCMPUNORDPS / CMPUNORDPS instructions. Definition at line 992 of file xmmintrin.h. Compares two 32-bit float values in the low-order bits of both operands to determine if the value in the first operand is unordered with respect to the corresponding value in the second operand and returns the result of the comparison in the low-order bits of a vector of [4 x float]. This intrinsic corresponds to the VCMPUNORDSS / CMPUNORDSS instructions. Definition at line 972 of file xmmintrin.h. Compares two 32-bit float values in the low-order bits of both operands for equality and returns the result of the comparison. If either of the two lower 32-bit values is NaN, 0 is returned. This intrinsic corresponds to the VCOMISS / COMISS instructions. __a A 128-bit vector of [4 x float]. The lower 32 bits of this operand are used in the comparison. __b A 128-bit vector of [4 x float]. The lower 32 bits of this operand are used in the comparison. An integer containing the comparison results. If either of the two lower 32-bit values is NaN, 0 is returned. Definition at line 1016 of file xmmintrin.h. Compares two 32-bit float values in the low-order bits of both operands to determine if the first operand is greater than or equal to the second operand and returns the result of the comparison. Definition at line 1113 of file xmmintrin.h. Compares two 32-bit float values in the low-order bits of both operands to determine if the first operand is greater than the second operand and returns the result of the comparison. Definition at line 1089 of file xmmintrin.h. Compares two 32-bit float values in the low-order bits of both operands to determine if the first operand is less than or equal to the second operand and returns the result of the comparison. Definition at line 1065 of file xmmintrin.h. Compares two 32-bit float values in the low-order bits of both operands to determine if the first operand is less than the second operand and returns the result of the comparison. Definition at line 1041 of file xmmintrin.h. Compares two 32-bit float values in the low-order bits of both operands to determine if the first operand is not equal to the second operand and returns the result of the comparison. If either of the two lower 32-bit values is NaN, 1 is returned. An integer containing the comparison results. If either of the two lower 32-bit values is NaN, 1 is returned. Definition at line 1137 of file xmmintrin.h. Converts two elements of a 64-bit vector of [2 x i32] into two floating point values and writes them to the lower 64-bits of the destination. The remaining higher order elements of the destination are copied from the corresponding elements in the first operand. This intrinsic corresponds to the CVTPI2PS instruction. __b A 64-bit vector of [2 x i32]. The elements in this vector are converted and written to the corresponding low-order elements in the destination. A 128-bit vector of [4 x float] whose lower 64 bits contain the converted value from the second operand. The upper 64 bits are copied from the upper 64 bits of the first operand. Definition at line 1586 of file xmmintrin.h. Converts two low-order float values in a 128-bit vector of [4 x float] into a 64-bit vector of [2 x i32]. This intrinsic corresponds to the CVTPS2PI instruction. A 64-bit integer vector containing the converted values. Definition at line 1374 of file xmmintrin.h. Converts a 32-bit signed integer value into a floating point value and writes it to the lower 32 bits of the destination. This intrinsic corresponds to the VCVTSI2SS / CVTSI2SS instruction. __b A 32-bit signed integer operand containing the value to be converted. A 128-bit vector of [4 x float] whose lower 32 bits contain the converted value of the second operand. The upper 96 bits are copied from the upper 96 bits of the first operand. Definition at line 1513 of file xmmintrin.h. References __a, __b, __DEFAULT_FN_ATTRS, __DEFAULT_FN_ATTRS_MMX, and _mm_cvtsi32_ss(). Converts a float value contained in the lower 32 bits of a vector of [4 x float] into a 32-bit integer. This intrinsic corresponds to the VCVTSS2SI / CVTSS2SI instructions. __a A 128-bit vector of [4 x float]. The lower 32 bits of this operand are used in the conversion. A 32-bit integer containing the converted value. Definition at line 1320 of file xmmintrin.h. References __a, __DEFAULT_FN_ATTRS, __DEFAULT_FN_ATTRS_MMX, and _mm_cvtss_si32(). Converts a 64-bit vector of [4 x i16] into a 128-bit vector of [4 x float]. This intrinsic corresponds to the CVTPI2PS + COMPOSITE instruction. __a A 64-bit vector of [4 x i16]. The elements of the destination are copied from the corresponding elements in this operand. A 128-bit vector of [4 x float] containing the copied and converted values from the operand. Definition at line 2721 of file xmmintrin.h. References __b, __c, __DEFAULT_FN_ATTRS_MMX, _mm_cmpgt_pi16(), _mm_cvtpi32_ps(), _mm_movelh_ps(), _mm_setzero_ps(), _mm_setzero_si64(), _mm_unpackhi_pi16(), and _mm_unpacklo_pi16(). Referenced by _mm_cvtpi8_ps(), and _mm_cvtpu8_ps(). A 128-bit vector of [4 x float] whose lower 64 bits contain the converted value of the second operand. The upper 64 bits are copied from the upper 64 bits of the first operand. Definition at line 1563 of file xmmintrin.h. Referenced by _mm_cvt_pi2ps(), _mm_cvtpi16_ps(), _mm_cvtpi32x2_ps(), and _mm_cvtpu16_ps(). Converts the two 32-bit signed integer values from each 64-bit vector operand of [2 x i32] into a 128-bit vector of [4 x float]. __a A 64-bit vector of [2 x i32]. The lower elements of the destination are copied from the elements in this operand. __b A 64-bit vector of [2 x i32]. The upper elements of the destination are copied from the elements in this operand. A 128-bit vector of [4 x float] whose lower 64 bits contain the copied and converted values from the first operand. The upper 64 bits contain the copied and converted values from the second operand. Definition at line 2832 of file xmmintrin.h. References __c, __DEFAULT_FN_ATTRS_MMX, _mm_cvtpi32_ps(), _mm_movelh_ps(), and _mm_setzero_ps(). Converts the lower four 8-bit values from a 64-bit vector of [8 x i8] into a 128-bit vector of [4 x float]. __a A 64-bit vector of [8 x i8]. The elements of the destination are copied from the corresponding lower 4 elements in this operand. Definition at line 2780 of file xmmintrin.h. References __b, __DEFAULT_FN_ATTRS_MMX, _mm_cmpgt_pi8(), _mm_cvtpi16_ps(), _mm_setzero_si64(), and _mm_unpacklo_pi8(). Converts each single-precision floating-point element of a 128-bit floating-point vector of [4 x float] into a 16-bit signed integer, and packs the results into a 64-bit integer vector of [4 x i16]. If the floating-point element is NaN or infinity, or if the floating-point element is greater than 0x7FFFFFFF or less than -0x8000, it is converted to 0x8000. Otherwise if the floating-point element is greater than 0x7FFF, it is converted to 0x7FFF. This intrinsic corresponds to the CVTPS2PI + COMPOSITE instruction. __a A 128-bit floating-point vector of [4 x float]. A 64-bit integer vector of [4 x i16] containing the converted values. Definition at line 2861 of file xmmintrin.h. References __b, __c, __DEFAULT_FN_ATTRS_MMX, _mm_cvtps_pi32(), _mm_movehl_ps(), and _mm_packs_pi32(). Definition at line 1358 of file xmmintrin.h. Referenced by _mm_cvt_ps2pi(), and _mm_cvtps_pi16(). Converts each single-precision floating-point element of a 128-bit floating-point vector of [4 x float] into an 8-bit signed integer, and packs the results into the lower 32 bits of a 64-bit integer vector of [8 x i8]. The upper 32 bits of the vector are set to 0. If the floating-point element is NaN or infinity, or if the floating-point element is greater than 0x7FFFFFFF or less than -0x80, it is converted to 0x80. Otherwise if the floating-point element is greater than 0x7F, it is converted to 0x7F. __a 128-bit floating-point vector of [4 x float]. A 64-bit integer vector of [8 x i8]. The lower 32 bits contain the converted values and the uppper 32 bits are set to zero. Definition at line 2891 of file xmmintrin.h. References __b, __c, __DEFAULT_FN_ATTRS, _mm_cvtps_pi16(), _mm_packs_pi16(), and _mm_setzero_si64(). Converts a 64-bit vector of 16-bit unsigned integer values into a 128-bit vector of [4 x float]. __a A 64-bit vector of 16-bit unsigned integer values. The elements of the destination are copied from the corresponding elements in this operand. Definition at line 2751 of file xmmintrin.h. References __b, __c, __DEFAULT_FN_ATTRS_MMX, _mm_cvtpi32_ps(), _mm_movelh_ps(), _mm_setzero_ps(), _mm_setzero_si64(), _mm_unpackhi_pi16(), and _mm_unpacklo_pi16(). Converts the lower four unsigned 8-bit integer values from a 64-bit vector of [8 x u8] into a 128-bit vector of [4 x float]. __a A 64-bit vector of unsigned 8-bit integer values. The elements of the destination are copied from the corresponding lower 4 elements in this operand. A 128-bit vector of [4 x float] containing the copied and converted values from the source operand. Definition at line 2805 of file xmmintrin.h. References __b, __DEFAULT_FN_ATTRS_MMX, _mm_cvtpi16_ps(), _mm_setzero_si64(), and _mm_unpacklo_pi8(). 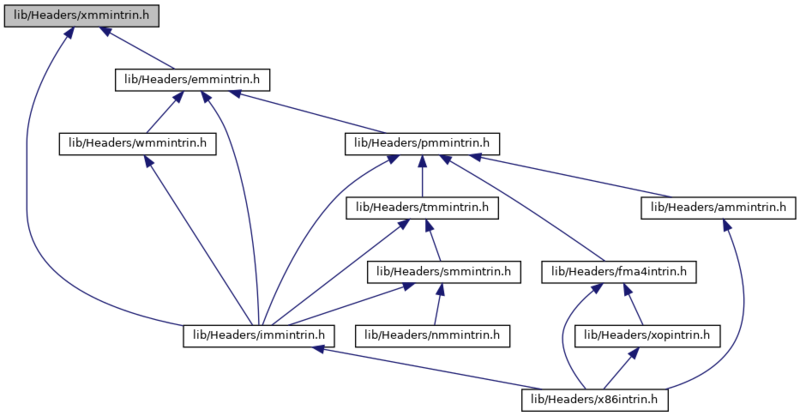 The remaining higher order elements of the destination vector are copied from the corresponding elements in the first operand. Definition at line 1490 of file xmmintrin.h. References __a, __b, and __DEFAULT_FN_ATTRS. Extracts a float value contained in the lower 32 bits of a vector of [4 x float]. This intrinsic has no corresponding instruction. __a A 128-bit vector of [4 x float]. The lower 32 bits of this operand are used in the extraction. A 32-bit float containing the extracted value. Definition at line 1603 of file xmmintrin.h. Definition at line 1302 of file xmmintrin.h. Converts two low-order float values in a 128-bit vector of [4 x float] into a 64-bit vector of [2 x i32], truncating the result when it is inexact. This intrinsic corresponds to the CVTTPS2PI instruction. Definition at line 1468 of file xmmintrin.h. Converts a float value contained in the lower 32 bits of a vector of [4 x float] into a 32-bit integer, truncating the result when it is inexact. This intrinsic corresponds to the VCVTTSS2SI / CVTTSS2SI instructions. Definition at line 1412 of file xmmintrin.h. References __DEFAULT_FN_ATTRS, __DEFAULT_FN_ATTRS_MMX, and _mm_cvttss_si32(). This intrinsic corresponds to the CVTTPS2PI / VTTPS2PI instructions. Definition at line 1451 of file xmmintrin.h. Definition at line 1393 of file xmmintrin.h. Divides two 128-bit vectors of [4 x float]. This intrinsic corresponds to the VDIVPS / DIVPS instructions. __a A 128-bit vector of [4 x float] containing the dividend. __b A 128-bit vector of [4 x float] containing the divisor. A 128-bit vector of [4 x float] containing the quotients of both operands. Definition at line 196 of file xmmintrin.h. Referenced by _mm_mask_div_ps(), and _mm_maskz_div_ps(). Divides the value in the low-order 32 bits of the first operand by the corresponding value in the second operand. This intrinsic corresponds to the VDIVSS / DIVSS instructions. __a A 128-bit vector of [4 x float] containing the dividend. The lower 32 bits of this operand are used in the calculation. __b A 128-bit vector of [4 x float] containing the divisor. The lower 32 bits of this operand are used in the calculation. A 128-bit vector of [4 x float] containing the quotients of the lower 32 bits of both operands. The upper 96 bits are copied from the upper 96 bits of the first source operand. Definition at line 177 of file xmmintrin.h. Referenced by _mm_mask_div_ss(), and _mm_maskz_div_ss(). Returns the contents of the MXCSR register as a 32-bit unsigned integer value. For checking exception states: _MM_EXCEPT_INVALID, _MM_EXCEPT_DIV_ZERO, _MM_EXCEPT_DENORM, _MM_EXCEPT_OVERFLOW, _MM_EXCEPT_UNDERFLOW, _MM_EXCEPT_INEXACT. There is a convenience wrapper _MM_GET_EXCEPTION_STATE(). For checking exception masks: _MM_MASK_UNDERFLOW, _MM_MASK_OVERFLOW, _MM_MASK_INVALID, _MM_MASK_DENORM, _MM_MASK_DIV_ZERO, _MM_MASK_INEXACT. There is a convenience wrapper _MM_GET_EXCEPTION_MASK(). For checking rounding modes: _MM_ROUND_NEAREST, _MM_ROUND_DOWN, _MM_ROUND_UP, _MM_ROUND_TOWARD_ZERO. There is a convenience wrapper _MM_GET_ROUNDING_MODE(). For checking flush-to-zero mode: _MM_FLUSH_ZERO_ON, _MM_FLUSH_ZERO_OFF. There is a convenience wrapper _MM_GET_FLUSH_ZERO_MODE(). For checking denormals-are-zero mode: _MM_DENORMALS_ZERO_ON, _MM_DENORMALS_ZERO_OFF. There is a convenience wrapper _MM_GET_DENORMALS_ZERO_MODE(). This intrinsic corresponds to the VSTMXCSR / STMXCSR instruction. A 32-bit unsigned integer containing the contents of the MXCSR register. Loads a 32-bit float value and duplicates it to all four vector elements of a 128-bit vector of [4 x float]. This intrinsic corresponds to the VBROADCASTSS / MOVSS + shuffling instruction. __p A pointer to a float value to be loaded and duplicated. A 128-bit vector of [4 x float] containing the loaded and duplicated values. Definition at line 1700 of file xmmintrin.h. Loads a 128-bit floating-point vector of [4 x float] from an aligned memory location. This intrinsic corresponds to the VMOVAPS / MOVAPS instruction. __p A pointer to a 128-bit memory location. The address of the memory location has to be 128-bit aligned. A 128-bit vector of [4 x float] containing the loaded values. Definition at line 1723 of file xmmintrin.h. The lower 32 bits of the vector are initialized with the single-precision floating-point value loaded from a specified memory location. The upper 96 bits are set to zero. This intrinsic corresponds to the VMOVSS / MOVSS instruction. __p A pointer to a 32-bit memory location containing a single-precision floating-point value. An initialized 128-bit floating-point vector of [4 x float]. The lower 32 bits contain the value loaded from the memory location. The upper 96 bits are set to zero. Definition at line 1678 of file xmmintrin.h. Loads two packed float values from the address __p into the high-order bits of a 128-bit vector of [4 x float]. The low-order bits are copied from the low-order bits of the first operand. This intrinsic corresponds to the VMOVHPD / MOVHPD instruction. __a A 128-bit vector of [4 x float]. Bits [63:0] are written to bits [63:0] of the destination. __p A pointer to two packed float values. Bits [63:0] are written to bits [127:64] of the destination. A 128-bit vector of [4 x float] containing the moved values. Definition at line 1624 of file xmmintrin.h. Loads two packed float values from the address __p into the low-order bits of a 128-bit vector of [4 x float]. The high-order bits are copied from the high-order bits of the first operand. This intrinsic corresponds to the VMOVLPD / MOVLPD instruction. __a A 128-bit vector of [4 x float]. Bits [127:64] are written to bits [127:64] of the destination. __p A pointer to two packed float values. Bits [63:0] are written to bits [63:0] of the destination. Definition at line 1651 of file xmmintrin.h. Loads four packed float values, in reverse order, from an aligned memory location to 32-bit elements in a 128-bit vector of [4 x float]. This intrinsic corresponds to the VMOVAPS / MOVAPS + shuffling instruction. A 128-bit vector of [4 x float] containing the moved values, loaded in reverse order. Definition at line 1762 of file xmmintrin.h. Loads a 128-bit floating-point vector of [4 x float] from an unaligned memory location. This intrinsic corresponds to the VMOVUPS / MOVUPS instruction. __p A pointer to a 128-bit memory location. The address of the memory location does not have to be aligned. Definition at line 1740 of file xmmintrin.h. Referenced by _mm256_broadcast_ps(), and _mm256_loadu2_m128(). Conditionally copies the values from each 8-bit element in the first 64-bit integer vector operand to the specified memory location, as specified by the most significant bit in the corresponding element in the second 64-bit integer vector operand. To minimize caching, the data is flagged as non-temporal (unlikely to be used again soon). This intrinsic corresponds to the MASKMOVQ instruction. __d A 64-bit integer vector containing the values with elements to be copied. __n A 64-bit integer vector operand. The most significant bit from each 8-bit element determines whether the corresponding element in operand __d is copied. If the most significant bit of a given element is 1, the corresponding element in operand __d is copied. __p A pointer to a 64-bit memory location that will receive the conditionally copied integer values. The address of the memory location does not have to be aligned. Definition at line 2380 of file xmmintrin.h. Compares each of the corresponding packed 16-bit integer values of the 64-bit integer vectors, and writes the greater value to the corresponding bits in the destination. This intrinsic corresponds to the PMAXSW instruction. A 64-bit integer vector containing the comparison results. Definition at line 2223 of file xmmintrin.h. Compares two 128-bit vectors of [4 x float] and returns the greater of each pair of values. This intrinsic corresponds to the VMAXPS / MAXPS instructions. __a A 128-bit vector of [4 x float] containing one of the operands. __b A 128-bit vector of [4 x float] containing one of the operands. A 128-bit vector of [4 x float] containing the maximum values between both operands. Definition at line 386 of file xmmintrin.h. Referenced by _mm_mask_max_ps(), and _mm_maskz_max_ps(). Compares each of the corresponding packed 8-bit unsigned integer values of the 64-bit integer vectors, and writes the greater value to the corresponding bits in the destination. This intrinsic corresponds to the PMAXUB instruction. Definition at line 2242 of file xmmintrin.h. Compares two 32-bit float values in the low-order bits of both operands and returns the greater value in the low-order bits of a 128-bit vector of [4 x float]. This intrinsic corresponds to the VMAXSS / MAXSS instructions. A 128-bit vector of [4 x float] whose lower 32 bits contain the maximum value between both operands. The upper 96 bits are copied from the upper 96 bits of the first source operand. Definition at line 367 of file xmmintrin.h. Compares each of the corresponding packed 16-bit integer values of the 64-bit integer vectors, and writes the lesser value to the corresponding bits in the destination. This intrinsic corresponds to the PMINSW instruction. Definition at line 2261 of file xmmintrin.h. Compares two 128-bit vectors of [4 x float] and returns the lesser of each pair of values. This intrinsic corresponds to the VMINPS / MINPS instructions. A 128-bit vector of [4 x float] containing the minimum values between both operands. Definition at line 344 of file xmmintrin.h. Referenced by _mm_mask_min_ps(), and _mm_maskz_min_ps(). Compares each of the corresponding packed 8-bit unsigned integer values of the 64-bit integer vectors, and writes the lesser value to the corresponding bits in the destination. This intrinsic corresponds to the PMINUB instruction. Definition at line 2280 of file xmmintrin.h. Compares two 32-bit float values in the low-order bits of both operands and returns the lesser value in the low-order bits of the vector of [4 x float]. This intrinsic corresponds to the VMINSS / MINSS instructions. A 128-bit vector of [4 x float] whose lower 32 bits contain the minimum value between both operands. The upper 96 bits are copied from the upper 96 bits of the first source operand. Definition at line 325 of file xmmintrin.h. The lower 32 bits are set to the lower 32 bits of the second parameter. The upper 96 bits are set to the upper 96 bits of the first parameter. This intrinsic corresponds to the VBLENDPS / BLENDPS / MOVSS instruction. __a A 128-bit floating-point vector of [4 x float]. The upper 96 bits are written to the upper 96 bits of the result. __b A 128-bit floating-point vector of [4 x float]. The lower 32 bits are written to the lower 32 bits of the result. A 128-bit floating-point vector of [4 x float]. Definition at line 2660 of file xmmintrin.h. Referenced by _mm_mask_move_ss(), and _mm_maskz_move_ss(). The lower 64 bits are set to the upper 64 bits of the second parameter. The upper 64 bits are set to the upper 64 bits of the first parameter. This intrinsic corresponds to the VUNPCKHPD / UNPCKHPD instruction. __a A 128-bit floating-point vector of [4 x float]. The upper 64 bits are written to the upper 64 bits of the result. __b A 128-bit floating-point vector of [4 x float]. The upper 64 bits are written to the lower 64 bits of the result. Definition at line 2682 of file xmmintrin.h. The lower 64 bits are set to the lower 64 bits of the first parameter. The upper 64 bits are set to the lower 64 bits of the second parameter. This intrinsic corresponds to the VUNPCKLPD / UNPCKLPD instruction. __a A 128-bit floating-point vector of [4 x float]. The lower 64 bits are written to the lower 64 bits of the result. __b A 128-bit floating-point vector of [4 x float]. The lower 64 bits are written to the upper 64 bits of the result. Definition at line 2703 of file xmmintrin.h. Referenced by _mm_cvtpi16_ps(), _mm_cvtpi32x2_ps(), and _mm_cvtpu16_ps(). Takes the most significant bit from each 8-bit element in a 64-bit integer vector to create an 8-bit mask value. Zero-extends the value to 32-bit integer and writes it to the destination. This intrinsic corresponds to the PMOVMSKB instruction. __a A 64-bit integer vector containing the values with bits to be extracted. The most significant bit from each 8-bit element in __a, written to bits [7:0]. Definition at line 2298 of file xmmintrin.h. Extracts the sign bits from each single-precision floating-point element of a 128-bit floating-point vector of [4 x float] and returns the sign bits in bits [0:3] of the result. Bits [31:4] of the result are set to zero. This intrinsic corresponds to the VMOVMSKPS / MOVMSKPS instruction. A 32-bit integer value. Bits [3:0] contain the sign bits from each single-precision floating-point element of the parameter. Bits [31:4] are set to zero. Definition at line 2916 of file xmmintrin.h. Multiplies two 128-bit vectors of [4 x float] and returns the results of the multiplication. This intrinsic corresponds to the VMULPS / MULPS instructions. A 128-bit vector of [4 x float] containing the products of both operands. Definition at line 155 of file xmmintrin.h. Referenced by _mm_mask_mul_ps(), and _mm_maskz_mul_ps(). Multiplies two 32-bit float values in the low-order bits of the operands. This intrinsic corresponds to the VMULSS / MULSS instructions. A 128-bit vector of [4 x float] containing the product of the lower 32 bits of both operands. The upper 96 bits are copied from the upper 96 bits of the first source operand. Definition at line 135 of file xmmintrin.h. Referenced by _mm_mask_mul_ss(), and _mm_maskz_mul_ss(). Multiplies packed 16-bit unsigned integer values and writes the high-order 16 bits of each 32-bit product to the corresponding bits in the destination. This intrinsic corresponds to the PMULHUW instruction. A 64-bit integer vector containing the products of both operands. Definition at line 2317 of file xmmintrin.h. Performs a bitwise OR of two 128-bit vectors of [4 x float]. This intrinsic corresponds to the VORPS / ORPS instructions. A 128-bit vector of [4 x float] containing the bitwise OR of the values between both operands. Definition at line 444 of file xmmintrin.h. Referenced by _mm_mask_or_ps(), and _mm_maskz_or_ps(). Calculates the approximate reciprocals of the values stored in a 128-bit vector of [4 x float]. This intrinsic corresponds to the VRCPPS / RCPPS instructions. A 128-bit vector of [4 x float] containing the approximate reciprocals of the values in the operand. Definition at line 266 of file xmmintrin.h. Calculates the approximate reciprocal of the value stored in the low-order bits of a 128-bit vector of [4 x float]. This intrinsic corresponds to the VRCPSS / RCPSS instructions. __a A 128-bit vector of [4 x float]. The lower 32 bits of this operand are used in the calculation. A 128-bit vector of [4 x float] containing the approximate reciprocal of the value in the low-order bits of the operand. Definition at line 249 of file xmmintrin.h. Calculates the approximate reciprocals of the square roots of the values stored in a 128-bit vector of [4 x float]. This intrinsic corresponds to the VRSQRTPS / RSQRTPS instructions. A 128-bit vector of [4 x float] containing the approximate reciprocals of the square roots of the values in the operand. Definition at line 302 of file xmmintrin.h. Calculates the approximate reciprocal of the square root of the value stored in the low-order bits of a 128-bit vector of [4 x float]. This intrinsic corresponds to the VRSQRTSS / RSQRTSS instructions. A 128-bit vector of [4 x float] containing the approximate reciprocal of the square root of the value in the low-order bits of the operand. Definition at line 285 of file xmmintrin.h. Subtracts the corresponding 8-bit unsigned integer values of the two 64-bit vector operands and computes the absolute value for each of the difference. Then sum of the 8 absolute differences is written to the bits [15:0] of the destination; the remaining bits [63:16] are cleared. This intrinsic corresponds to the PSADBW instruction. A 64-bit integer vector whose lower 16 bits contain the sums of the sets of absolute differences between both operands. The upper bits are cleared. Definition at line 2440 of file xmmintrin.h. Constructs a 128-bit floating-point vector of [4 x float], with each of the four single-precision floating-point vector elements set to the specified single-precision floating-point value. This intrinsic corresponds to the VPERMILPS / PERMILPS instruction. __w A single-precision floating-point value used to initialize each vector element of the result. An initialized 128-bit floating-point vector of [4 x float]. Definition at line 1814 of file xmmintrin.h. Constructs a 128-bit floating-point vector of [4 x float] initialized with the specified single-precision floating-point values. This intrinsic is a utility function and does not correspond to a specific instruction. __z A single-precision floating-point value used to initialize bits [127:96] of the result. __y A single-precision floating-point value used to initialize bits [95:64] of the result. __x A single-precision floating-point value used to initialize bits [63:32] of the result. __w A single-precision floating-point value used to initialize bits [31:0] of the result. Definition at line 1860 of file xmmintrin.h. References __DEFAULT_FN_ATTRS, __x, and __y. Definition at line 1833 of file xmmintrin.h. The lower 32 bits of the vector are initialized with the specified single-precision floating-point value. The upper 96 bits are set to zero. __w A single-precision floating-point value used to initialize the lower 32 bits of the result. An initialized 128-bit floating-point vector of [4 x float]. The lower 32 bits contain the value provided in the source operand. The upper 96 bits are set to zero. Definition at line 1796 of file xmmintrin.h. Sets the MXCSR register with the 32-bit unsigned integer value. For setting exception states: _MM_EXCEPT_INVALID, _MM_EXCEPT_DIV_ZERO, _MM_EXCEPT_DENORM, _MM_EXCEPT_OVERFLOW, _MM_EXCEPT_UNDERFLOW, _MM_EXCEPT_INEXACT. There is a convenience wrapper _MM_SET_EXCEPTION_STATE(x) where x is one of these macros. For setting exception masks: _MM_MASK_UNDERFLOW, _MM_MASK_OVERFLOW, _MM_MASK_INVALID, _MM_MASK_DENORM, _MM_MASK_DIV_ZERO, _MM_MASK_INEXACT. There is a convenience wrapper _MM_SET_EXCEPTION_MASK(x) where x is one of these macros. For setting rounding modes: _MM_ROUND_NEAREST, _MM_ROUND_DOWN, _MM_ROUND_UP, _MM_ROUND_TOWARD_ZERO. There is a convenience wrapper _MM_SET_ROUNDING_MODE(x) where x is one of these macros. For setting flush-to-zero mode: _MM_FLUSH_ZERO_ON, _MM_FLUSH_ZERO_OFF. There is a convenience wrapper _MM_SET_FLUSH_ZERO_MODE(x) where x is one of these macros. For setting denormals-are-zero mode: _MM_DENORMALS_ZERO_ON, _MM_DENORMALS_ZERO_OFF. There is a convenience wrapper _MM_SET_DENORMALS_ZERO_MODE(x) where x is one of these macros. This intrinsic corresponds to the VLDMXCSR / LDMXCSR instruction. __i A 32-bit unsigned integer value to be written to the MXCSR register. Constructs a 128-bit floating-point vector of [4 x float], initialized in reverse order with the specified 32-bit single-precision float-point values. __z A single-precision floating-point value used to initialize bits [31:0] of the result. __y A single-precision floating-point value used to initialize bits [63:32] of the result. __x A single-precision floating-point value used to initialize bits [95:64] of the result. __w A single-precision floating-point value used to initialize bits [127:96] of the result. Definition at line 1888 of file xmmintrin.h. Constructs a 128-bit floating-point vector of [4 x float] initialized to zero. This intrinsic corresponds to the VXORPS / XORPS instruction. An initialized 128-bit floating-point vector of [4 x float] with all elements set to zero. Definition at line 1903 of file xmmintrin.h. Referenced by _mm256_maskz_cvtepi64_ps(), _mm256_maskz_cvtepu64_ps(), _mm256_maskz_cvtpd_ps(), _mm256_zextps128_ps256(), _mm512_zextps128_ps512(), _mm_cvtepi64_ps(), _mm_cvtepu64_ps(), _mm_cvtpi16_ps(), _mm_cvtpi32x2_ps(), _mm_cvtpu16_ps(), _mm_getexp_ps(), _mm_getexp_ss(), _mm_mask_load_ss(), _mm_maskz_add_ps(), _mm_maskz_add_ss(), _mm_maskz_and_ps(), _mm_maskz_andnot_ps(), _mm_maskz_broadcastss_ps(), _mm_maskz_compress_ps(), _mm_maskz_cvtepi32_ps(), _mm_maskz_cvtepi64_ps(), _mm_maskz_cvtepu32_ps(), _mm_maskz_cvtepu64_ps(), _mm_maskz_cvtpd_ps(), _mm_maskz_cvtph_ps(), _mm_maskz_cvtsd_ss(), _mm_maskz_div_ps(), _mm_maskz_div_ss(), _mm_maskz_expand_ps(), _mm_maskz_expandloadu_ps(), _mm_maskz_fmadd_ps(), _mm_maskz_fmaddsub_ps(), _mm_maskz_fmsub_ps(), _mm_maskz_fmsubadd_ps(), _mm_maskz_fnmadd_ps(), _mm_maskz_fnmsub_ps(), _mm_maskz_getexp_ps(), _mm_maskz_getexp_ss(), _mm_maskz_load_ps(), _mm_maskz_load_ss(), _mm_maskz_loadu_ps(), _mm_maskz_max_ps(), _mm_maskz_max_ss(), _mm_maskz_min_ps(), _mm_maskz_min_ss(), _mm_maskz_mov_ps(), _mm_maskz_move_ss(), _mm_maskz_movehdup_ps(), _mm_maskz_moveldup_ps(), _mm_maskz_mul_ps(), _mm_maskz_mul_ss(), _mm_maskz_or_ps(), _mm_maskz_permutevar_ps(), _mm_maskz_permutex2var_ps(), _mm_maskz_rcp14_ps(), _mm_maskz_rcp14_ss(), _mm_maskz_rsqrt14_ps(), _mm_maskz_rsqrt14_ss(), _mm_maskz_scalef_ps(), _mm_maskz_scalef_ss(), _mm_maskz_sqrt_ps(), _mm_maskz_sqrt_ss(), _mm_maskz_sub_ps(), _mm_maskz_sub_ss(), _mm_maskz_unpackhi_ps(), _mm_maskz_unpacklo_ps(), _mm_maskz_xor_ps(), _mm_rcp14_ps(), _mm_rcp14_ss(), _mm_rsqrt14_ps(), _mm_rsqrt14_ss(), _mm_scalef_ps(), and _mm_scalef_ss(). Forces strong memory ordering (serialization) between store instructions preceding this instruction and store instructions following this instruction, ensuring the system completes all previous stores before executing subsequent stores. This intrinsic corresponds to the SFENCE instruction. Calculates the square roots of the values stored in a 128-bit vector of [4 x float]. This intrinsic corresponds to the VSQRTPS / SQRTPS instructions. A 128-bit vector of [4 x float] containing the square roots of the values in the operand. Definition at line 231 of file xmmintrin.h. Referenced by _mm_mask_sqrt_ps(), and _mm_maskz_sqrt_ps(). Calculates the square root of the value stored in the low-order bits of a 128-bit vector of [4 x float]. This intrinsic corresponds to the VSQRTSS / SQRTSS instructions. A 128-bit vector of [4 x float] containing the square root of the value in the low-order bits of the operand. Definition at line 214 of file xmmintrin.h. Stores the lower 32 bits of a 128-bit vector of [4 x float] into four contiguous elements in an aligned memory location. This intrinsic corresponds to VMOVAPS / MOVAPS + shuffling instruction. __p A pointer to a 128-bit memory location. __a A 128-bit vector of [4 x float] whose lower 32 bits are stored to each of the four contiguous elements pointed by __p. Definition at line 2015 of file xmmintrin.h. Stores a 128-bit vector of [4 x float] into an aligned memory location. __p A pointer to a 128-bit memory location. The address of the memory location has to be 16-byte aligned. __a A 128-bit vector of [4 x float] containing the values to be stored. Definition at line 1996 of file xmmintrin.h. Referenced by _mm_store1_ps(), and _mm_storer_ps(). Definition at line 2035 of file xmmintrin.h. Stores the lower 32 bits of a 128-bit vector of [4 x float] to a memory location. __p A pointer to a 32-bit memory location. __a A 128-bit vector of [4 x float] containing the value to be stored. Definition at line 1954 of file xmmintrin.h. Stores the upper 64 bits of a 128-bit vector of [4 x float] to a memory location. This intrinsic corresponds to the VPEXTRQ / PEXTRQ instruction. __p A pointer to a 64-bit memory location. Definition at line 1920 of file xmmintrin.h. Stores the lower 64 bits of a 128-bit vector of [4 x float] to a memory location. This intrinsic corresponds to the VMOVLPS / MOVLPS instruction. __p A pointer to a memory location that will receive the float values. Definition at line 1937 of file xmmintrin.h. Stores float values from a 128-bit vector of [4 x float] to an aligned memory location in reverse order. Definition at line 2054 of file xmmintrin.h. Stores a 128-bit vector of [4 x float] to an unaligned memory location. Definition at line 1975 of file xmmintrin.h. References __a, __DEFAULT_FN_ATTRS, and __v. Stores a 64-bit integer in the specified aligned memory location. This intrinsic corresponds to the MOVNTQ instruction. __p A pointer to an aligned memory location used to store the register value. __a A 64-bit integer containing the value to be stored. Definition at line 2112 of file xmmintrin.h. Moves packed float values from a 128-bit vector of [4 x float] to a 128-bit aligned memory location. This intrinsic corresponds to the VMOVNTPS / MOVNTPS instruction. __p A pointer to a 128-bit aligned memory location that will receive the single-precision floating-point values. __a A 128-bit vector of [4 x float] containing the values to be moved. Definition at line 2131 of file xmmintrin.h. Subtracts each of the values of the second operand from the first operand, both of which are 128-bit vectors of [4 x float] and returns the results of the subtraction. This intrinsic corresponds to the VSUBPS / SUBPS instructions. __a A 128-bit vector of [4 x float] containing the minuend. __b A 128-bit vector of [4 x float] containing the subtrahend. A 128-bit vector of [4 x float] containing the differences between both operands. Definition at line 113 of file xmmintrin.h. Referenced by _mm_mask_sub_ps(), and _mm_maskz_sub_ps(). Subtracts the 32-bit float value in the low-order bits of the second operand from the corresponding value in the first operand. This intrinsic corresponds to the VSUBSS / SUBSS instructions. __a A 128-bit vector of [4 x float] containing the minuend. The lower 32 bits of this operand are used in the calculation. __b A 128-bit vector of [4 x float] containing the subtrahend. The lower 32 bits of this operand are used in the calculation. A 128-bit vector of [4 x float] whose lower 32 bits contain the difference of the lower 32 bits of both operands. The upper 96 bits are copied from the upper 96 bits of the first source operand. Definition at line 92 of file xmmintrin.h. Referenced by _mm_mask_sub_ss(), and _mm_maskz_sub_ss(). Performs an unordered comparison of two 32-bit float values using the low-order bits of both operands to determine equality and returns the result of the comparison. This intrinsic corresponds to the VUCOMISS / UCOMISS instructions. Definition at line 1161 of file xmmintrin.h. Performs an unordered comparison of two 32-bit float values using the low-order bits of both operands to determine if the first operand is greater than or equal to the second operand and returns the result of the comparison. Definition at line 1260 of file xmmintrin.h. Performs an unordered comparison of two 32-bit float values using the low-order bits of both operands to determine if the first operand is greater than the second operand and returns the result of the comparison. Definition at line 1235 of file xmmintrin.h. Performs an unordered comparison of two 32-bit float values using the low-order bits of both operands to determine if the first operand is less than or equal to the second operand and returns the result of the comparison. Definition at line 1210 of file xmmintrin.h. Performs an unordered comparison of two 32-bit float values using the low-order bits of both operands to determine if the first operand is less than the second operand and returns the result of the comparison. Definition at line 1185 of file xmmintrin.h. Performs an unordered comparison of two 32-bit float values using the low-order bits of both operands to determine inequality and returns the result of the comparison. Definition at line 1284 of file xmmintrin.h. Create a 128-bit vector of [4 x float] with undefined values. A 128-bit vector of [4 x float] containing undefined values. Definition at line 1776 of file xmmintrin.h. Unpacks the high-order (index 2,3) values from two 128-bit vectors of [4 x float] and interleaves them into a 128-bit vector of [4 x float]. This intrinsic corresponds to the VUNPCKHPS / UNPCKHPS instruction. Bits [95:64] are written to bits [31:0] of the destination. Bits [127:96] are written to bits [95:64] of the destination. __b A 128-bit vector of [4 x float]. Bits [95:64] are written to bits [63:32] of the destination. Bits [127:96] are written to bits [127:96] of the destination. A 128-bit vector of [4 x float] containing the interleaved values. Definition at line 2616 of file xmmintrin.h. Referenced by _mm_mask_unpackhi_ps(), and _mm_maskz_unpackhi_ps(). Unpacks the low-order (index 0,1) values from two 128-bit vectors of [4 x float] and interleaves them into a 128-bit vector of [4 x float]. This intrinsic corresponds to the VUNPCKLPS / UNPCKLPS instruction. Bits [31:0] are written to bits [31:0] of the destination. Bits [63:32] are written to bits [95:64] of the destination. Bits [31:0] are written to bits [63:32] of the destination. Bits [63:32] are written to bits [127:96] of the destination. Definition at line 2638 of file xmmintrin.h. Referenced by _mm_mask_unpacklo_ps(), and _mm_maskz_unpacklo_ps(). Performs a bitwise exclusive OR of two 128-bit vectors of [4 x float]. This intrinsic corresponds to the VXORPS / XORPS instructions. A 128-bit vector of [4 x float] containing the bitwise exclusive OR of the values between both operands. Definition at line 463 of file xmmintrin.h. Referenced by _mm_mask_xor_ps(), and _mm_maskz_xor_ps().